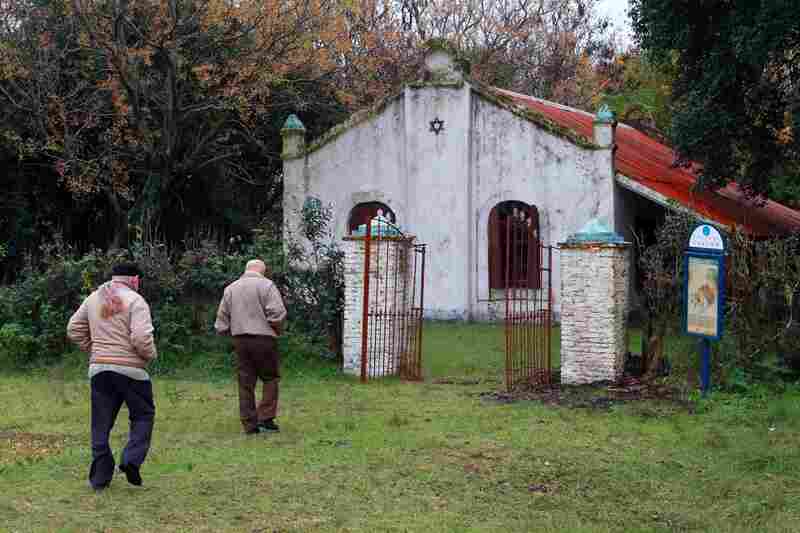 Argentina's Jewish Villages Keep Traditions Alive Thousands fled anti-Semitic violence in Russia in the 1890s for the vast, remote Pampas of Argentina. There, the settlers built synagogues, spoke Yiddish and lived the gaucho lifestyle on farms. Now their dwindling descendants are doing their best to keep up the traditions of their ancestors. 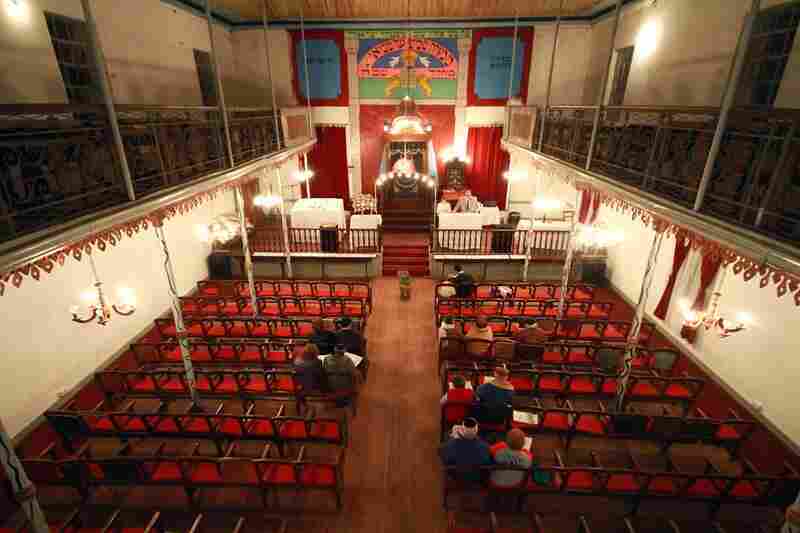 In Basavilbaso, Argentina, about 15 people attend a Friday night Shabbat celebration at the Tefila L'Moises Synagogue. Community leaders have managed to conserve the old synagogue, which has served the Jewish community for about a century, but very few people still attend services. Enrique Salomon (right) and Jose Roimiser have collected old objects and documents from more than a century ago, when Jews from Russia, Ukraine and Poland were flowing into this region. The Jewish Cemetery of Basavilbaso was founded in 1895 and is home to the graves of many of the first settlers of the region. 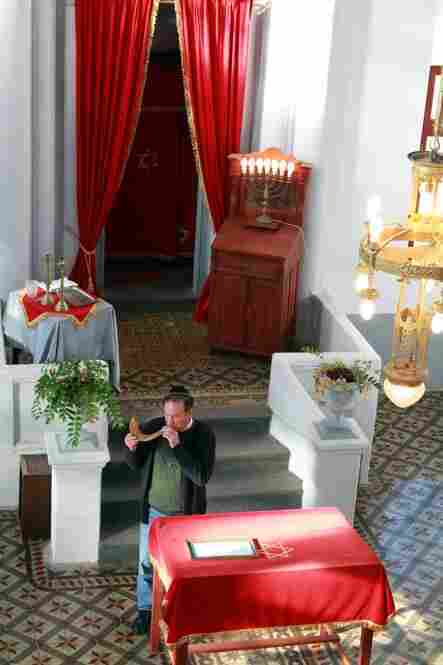 Abraham Kreiserman, president of the Jewish community of Villa Clara, sounds the shofar in the Beith Iacob Synagogue in Villa Clara. In the Israelite Association of Villa Clara, Patricia Acst de Loskin teaches Hebrew to the Jewish children of the town. Only eight children take the classes. This small synagogue was founded in 1895, a year after the settlement of Colonia Lucienville. Apart from being a religious center, the synagogue was used as a cultural, social and educational center. In Colonia Carmel Cemetery, the first graves go back to 1898. The graves are oriented east toward Jerusalem. 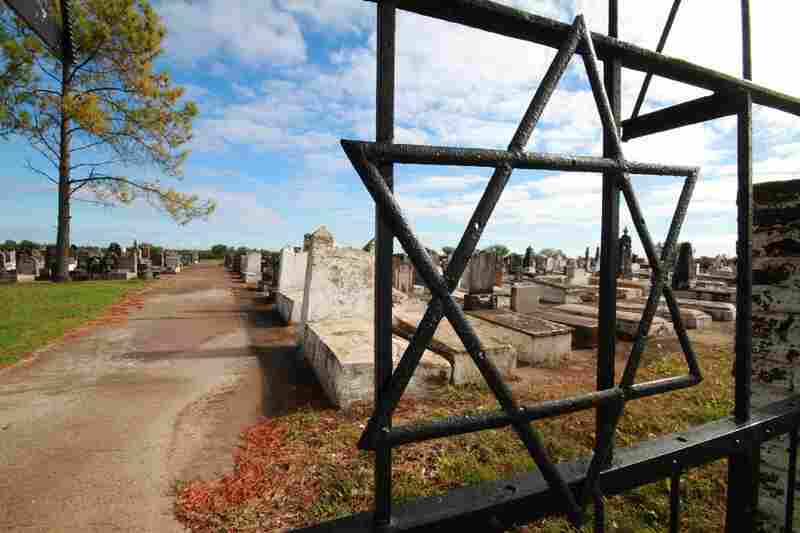 In the 1890s, Russian Jews fleeing anti-Semitic violence and discrimination arrived by the thousands to a remote corner of the Argentine Pampas. They founded hamlets similar to the shtetls they left behind. 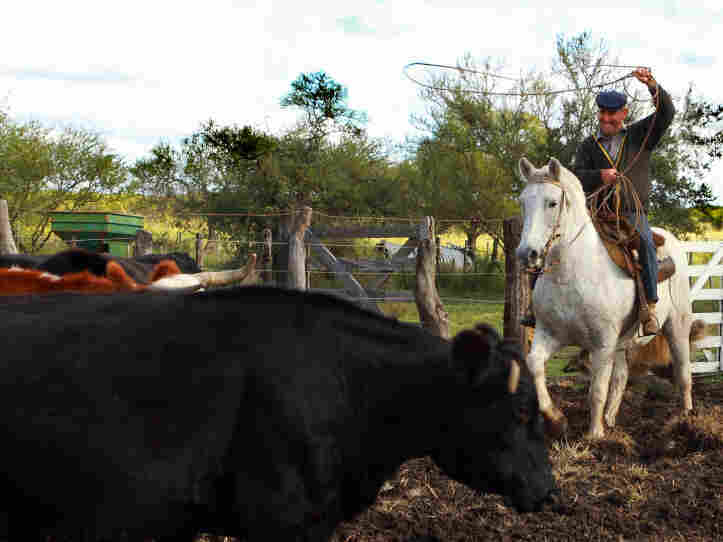 They spoke Yiddish, built synagogues and traditional Jewish schools — and became farmers and gauchos, the mythical Argentine cowboys. Now, only a dwindling number of their descendants remain, but they're intent on saving the Jewish culture that flourished for decades. 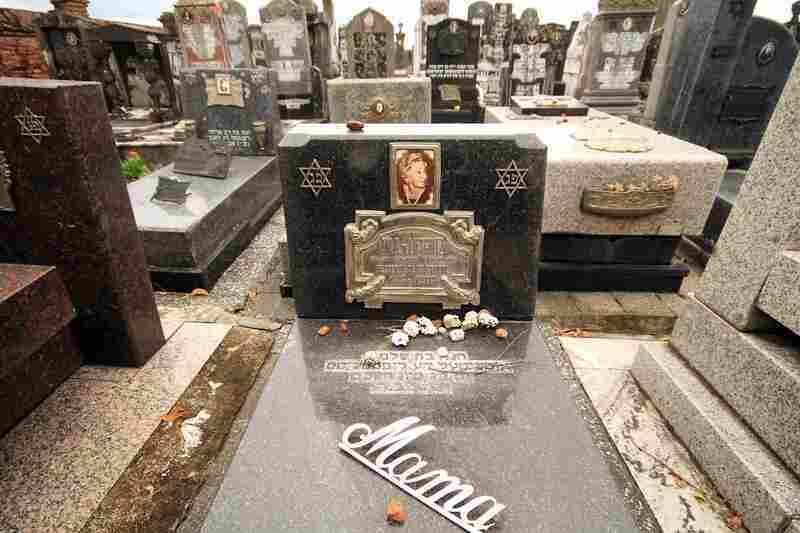 In Entre Rios province, the center of Argentina's rural Jewish communities, there are still gauchos, Hebrew lessons and sacred scrolls to be found. Jaime Jruz is among those who consider keeping the old traditions alive a debt owed to those who first settled the region. He roams his ranch on horseback, rounding up cattle and keeping track of his goats. His farm, on the outskirts of Carmel, goes back more than a century. It was bought on a payment plan by his grandfather, who had arrived in Argentina aboard the Bismarck, a ship carrying Jews seeking a new life in the New World. Now 65, Jruz says he has lost a step or two and is one of the last Jewish gauchos around. Jaime Jruz, son of Russian immigrants and leader of the Jewish community of Villa Dominguez, still works on the farm where he was born and grew up. Many of his friends have given up the backbreaking work, and his three daughters, like most young Argentine Jews, live in the cities. But Jruz says the past and the work his ancestors put into the farms of Entre Rios weigh heavily on him. "I couldn't abandon this," Jruz said, "I know the sacrifices they made to make it here." In the late 19th century, entire Jewish towns packed up and fled czarist pogroms. In what's now a footnote of history, a German-Jewish philanthropist, the Baron Maurice de Hirsch, envisioned a Jewish homeland not in the Middle East but in the Americas. He recruited would-be pioneers from the so-called Pale of Settlement, a region of Imperial Russia that today forms parts of Poland, Lithuania, Ukraine and other countries. Back then, though, it was where the czar permitted Jews to live. Through his Jewish Colonization Association, Hirsch bought up vast tracts of farmland in the United States, Canada, Brazil and Argentina, leasing them out to Jewish arrivals. "He felt that the future of the Jewish people was in America," says Osvaldo Dominguez, a Catholic who runs the Jewish Colonies Museum in Villa Dominguez and is considered a local expert on the Jewish history of rural Argentina. "But he had his greatest success here in Argentina." I couldn't abandon this. I know the sacrifices they made to make it here. Indeed, some 50,000 Jews came to Entre Rios and other rural provinces. They built up dozens of towns — communities with names like Sajaroff, Sonnenfeld and Moises Ville. Remnants of that vibrant past remain. In the nearby town of Villa Clara, Patricia Acst still teaches in Hebrew. Her young charges pay close attention — both of them. This school has one of the few Hebrew schools left. When she started teaching in 1983, things were very different. "There was class every day, from 1 to 5," Acst said, "and 18 students showed up." It was all in Hebrew, from geography to history to Talmudic studies. A couple of blocks away is the town synagogue, lovingly restored after Jewish leaders were able to drum up enough in donations. Abraham Kreiserman, a butcher who helped spearhead the renovations, shows off the temple's scrolls, some dating back to the early 19th century, as well as artifacts such as a shofar, or ram's horn. He blows the shofar for a foreign visitor, smiling and explaining it is the first time he has done so. 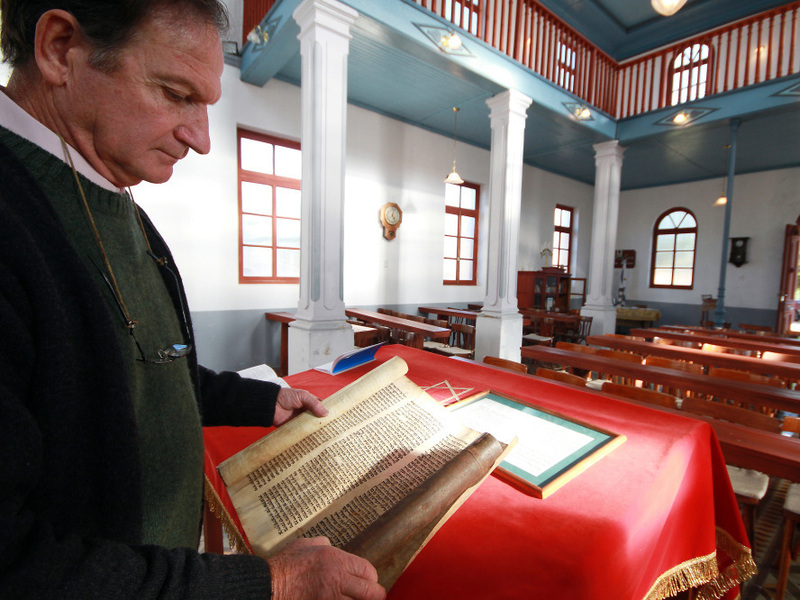 Abraham Kreiserman, the president of the Jewish community of Villa Clara, shows a portion of a Torah scroll at Beth Iacob Synagogue in Villa Clara. "Just a few of us are at the forefront of this," he said, referring to efforts to keep the synagogue going. "But despite the obstacles, we think we are doing a good job in the face of limited resources." 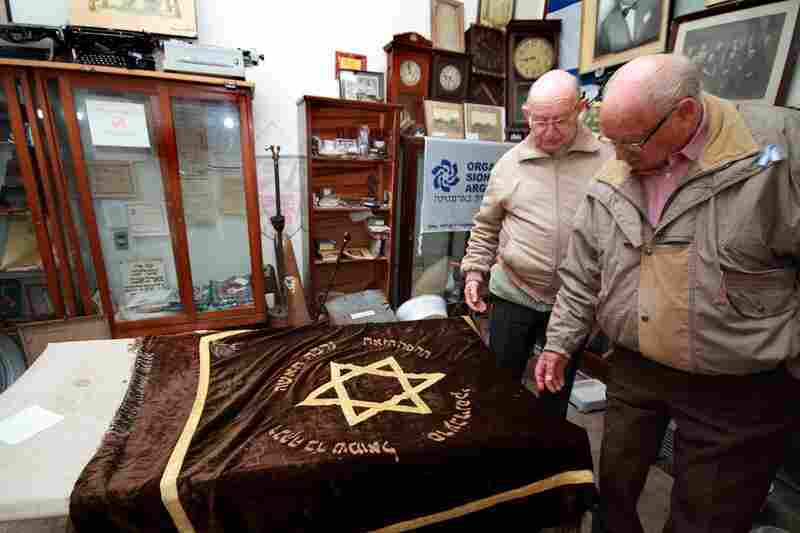 At the Jewish cultural center in the town of Basovilbaso, Enrique Salomon and Jose "Tito" Roimiser, 78 and 84 respectively, rummage through knickknacks once owned by their ancestors. They're in a musty storeroom filled with old framed photographs of men in black hats and long beards; wooden clocks; heavy metal typewriters; old deeds and titles. There's also a battered baby tub, once owned by Ezadik Shlomo Ezra Jalvinitz. "All of it is important; all of it has a history; all of it has a reason; all of it has an origin," Salomon says. Keys in hand, Salomon and "Tito" Roimiser then unlock the Torah ark at the Tefila L'Moises synagogue. "Here are four, six, seven sacred scrolls," Salomon said, "which we take out on the holiest holidays, read and then put back." They came from Russia, the two men note, and must receive the utmost care. Salomon and Roimiser describe themselves as keepers of the flame; they want to do all they can to preserve what's left of the town's Jewish culture. They also are under no illusions. "We try to maintain," said Roimiser, "but we are so few, so few, at least from my era." Still, they have fresh ideas, such as a museum that would go in an old synagogue, now abandoned. For the moment, though, there seems to still be enough Jewish life — just enough — to make it feel like it once was. On a Friday night, the old Jewish residents arrived at the Tefila L'Moises synagogue. They had a minyan — the quorum of 10 adults required for Sabbath services. As a rabbinical student sang, the congregation joined along. And for a moment, it seemed like old times again out on Argentina's Pampas.